Today, everyone knows that the present decline in the European currency has much to do with the current crisis in Greece. Like anywhere else, Greece has known ups and downs, and will eventually bounce back. Believe me, things were much worse for the Greeks 72 years ago. 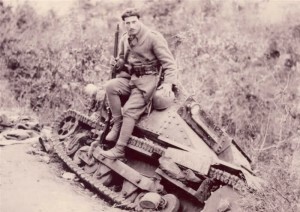 This week in the war, at dawn on Monday 28 October 1940, Italian troops stationed in Albania crossed the frontier into Greece. Mussolini had decided to extend Italy’s influence in the Mediterranean by opening up a whole new front. That morning, he and Hitler met at the Santa Maria Novella Florence railway station in Florence. Hitler had not received advance warning, but had read about the invasion a few hours earlier in the Italian papers. If he was annoyed, he didn’t show it. Maybe he would have done, if he had realized that he would have to bolster the Duce’s ill-conceived adventure by sending German troops into Greece the following spring. The Greek campaign delayed the Wehrmacht’s Operation Barbarossa by a few vital months—enough time for winter to set in and rob Hitler of his chance to capture Moscow. The British (Empire), on their own since the fall of France, suddenly had a new ally. The Royal Navy and an expeditionary force arrived to support the Greeks. 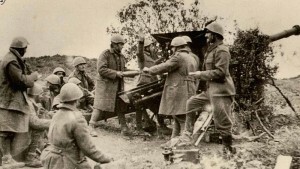 The Italian invasion, codenamed Emergenza G (in English: Emergency G[reece]), was conducted with little drive or enthusiasm by the forces involved. The Italian leadership was split by personal rivalries. Even the advantage of surprise was missing. Despite Greece’s lack of tanks and the overwhelming superiority of the Italian air force, the Greeks put up fierce resistance. They were helped by the mountainous terrain along the Albanian-Greek frontier. The Greeks slowly reinforced their troops along the border and eventually counter-attacked in force, invading and occupying large tracts of Albania. It was the first major Allied land victory of World War II. Hitler eventually intervened, although German troops did not cross into Greece until early April, 1941. The campaign ended a few weeks later, when SS-Obergruppenfuehrer Sepp Dietrich accepted the surrender of the Greek army. It was 20 April—Adolf Hitler’s birthday. This entry was posted in World War II and tagged Greece, Hitler, Mussolini, Operation Barbarossa, Sepp Dietrich. Bookmark the permalink.